Your Volusion store allows you to organize all of your products within logical categories and subcategories, making shopping easier for your customers! In your Admin Area, go to Inventory > Categories. Click View List in the top-right corner of the page. There are a number of demo categories set up in your store, but chances are, you don’t need most of them. Select the check box in the Delete column for any demo categories you want to delete. Now you can add your own new categories. Use the Show In Menu menu to select the menu the category should display under. The name of the menu varies by template, but you’ll probably want the select one of the first ones on the list (for example, Nav Menu 1). If you want to preview your new category on your storefront, click the View Store icon in your Volusion Toolbar. Now that you've set up your first category, you can continue creating the rest of your main categories! There is a slight, but important difference between a Nav Menu and a Category. A Nav Menu is the display holder for your categories. To keep it all straight, remember that Products go inside Categories and Categories go inside Nav Menus. Depending on how you envision your storefront, you may want to put categories in a top or side Nav Menu. The Nav Menu that corresponds to the top or left side of the storefront can vary, depending on which template you're using! 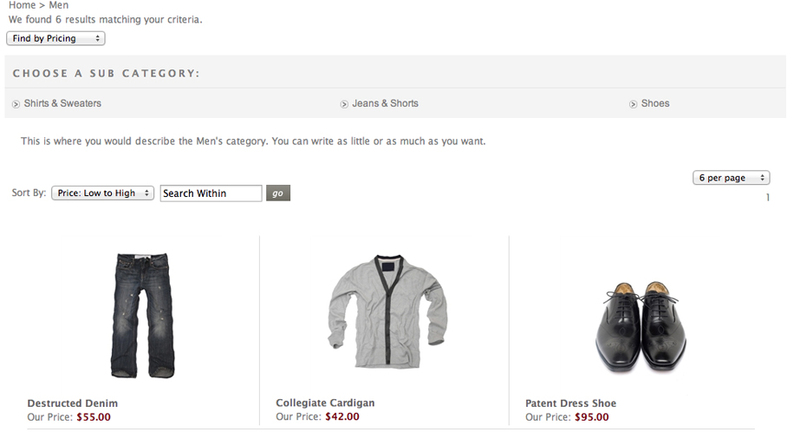 In the Product Display tab, you can select what product information you’d like to see displayed within the category. Make your Categories look more professional by customizing your subcategory display. You can edit the Subcategory Display Columns or use small, uniformly-sized subcategory images to make it easier for customers to navigate your site. Want to learn more about categories? To learn how to set up subcategories, manage advanced category features, add graphics, and more, see our Categories article! Your store is looking great – now it’s time to stock the shelves. To create a product, start with the basics – Name, Code, Price, and Weight. First, be sure to remove the sample products that came with your store to make room for your own. You can delete the Volusion sample products to make room for your own. To create a new product, click Add. Enter the product Weight. Note that the Weight field affects the product’s shipping settings, so you must enter a weight value greater than zero. Click Edit Categories to assign the product to one or more categories. Congratulations, you've created a product! To increase sales, you’ll want to add solid, unique product descriptions. Don’t just use the manufacturer’s description. Online shoppers rely on you to provide accurate, helpful descriptions that lead them to buy. Since your customers can't see your merchandise in person, having great product photos is the next best thing! When you upload a product image through the Admin Area, you'll also be able to display a thumbnail version on the category page(s) to which the product is assigned, the shopping cart page, and even your homepage if you make it a Featured product. Before you dive in, it's a good idea to gather all of your Product Images in one folder. You’ll want to make sure all your photos are the same dimensions, so that they look uniform and professional on your storefront. If you plan to show additional views using alternate product images, you should gather them in the same folder so that you can access them efficiently when creating products. Click on a product code to edit that product. Under the Image Management section, click Add. Click Browse to find the corresponding image file. The first image you upload will always be the main product image, unless you delete it! If you plan to display the Product Description Short on your category pages, use a uniform description length in that field to keep category pages looking uniform! For more detailed information on configuring advanced product settings, such as creating products with options, creating bundled products, or configuring downloadable products, see our complete Products user guide. For tips on great product photos, see Picture Perfect Product Photos. Getting your shelves stocked is exciting! Take a moment to celebrate getting all of your product and category information into your Volusion store, because you’re almost there.